Is Detroit’s New Light Rail Line America’s Greatest Boondoggle? A $137 million three-mile train is coming to a nearly deserted avenue in a bankrupt city. This News Item is Worth Reading, if Only for Its Headline Which Says . . .
Red Wings Generously Agree to Accept Huge Sums of Money From Public, by Bill Bradley, deadspin.com Jul. 21, 2014. In this case, “the pubic” means Detroit. Word reaches us that a verdict has come down in an eminent domain case in which the Los Angeles County Metropolitan Transportation Authority took a 3777 sq. ft. building (including a billboard) from the Veterans of Foreign Wars. The county’s “final” offer was $1,500,000, but after the court decided a motion in limine in the owner’s favor, the offer went up to $2,250,000. The verdict was $3,357,323 (on the owner’s appraisal opinion of $3,805,000, and the condemnor’s appraiser’s trial opinion of $1,004,000. Which makes the verdict 3.34 times the condemnor’s trial appraisal. So it appears that the condemnor proffered three different opinions of value for the same building, one of which was less than what it was before the trial court ruled on that motion in limine, whch sounds to us like some sort of effort on the condemnor’s part to grant itself a do-it-yourself motion in limine. And we are supposed to trust these guys? The owners intend to request the court to award them their attorneys’ fees. Stay tuned. You might think that folks who worry about human activities contributing to climate change would consume less energy than those who disagree. Right? Wrong. Remember Eminent Domain Takings for Malls? It’s 20 or 30 years later now, and guess what? Those big malls that were supposed to generate beaucoup money for cities in the form of sales taxes, and increased property taxes, are not doing so well. We could go on about this subject, and cite our readers to the book of MIT Professor Bernard Frieden and his co-author Lynn Sagalyn, Downtown: How America Rebuilds Cities, describing in detail how cities, working hand in glove with their favored [re]developers would take land by eminent domain, turn it over to those [re]developers at bargain basement prices, usually less than what the cities paid for it; the idea being that as the malls were constructed and filled with commercial tenants, the subject properties would get more valuable, pay more property taxes, etc., etc. As California Court of Appeal Justice Macklin Fleming once put it in one of his opinions, the promise was that all this would bake a bigger economic pie with bigger slices for all. Except, to continue in Justice Fleming’s metaphor, it often turned out that that instead of enriching everybody, these projects failed, producing only pie in the sky. Anyway, what is happening now is that the day of malls is over, and many of them are either in a state of decline or have gone bust altogether. Proceeding on the premise that a picture is worth a thousand words, we invite your attention to this internet posting that shows in vivid color the remnants of malls whose “pie” did not bake well. Click on http://www.buzzfeed.com/mjs538/completely-surreal-pictures-of-americas-abandoned-malls and you’ll get the picture. What is left unsaid however, is that often some of these malls were built with public funds, and to get that money and use it to cover the cost of land acquisition and mall construction, cities sold municipal bonds in the hope that the increased taxes generated by those malls would take care of servicing and eventually paying off those bonds, so as the promoters of these projects sometimes bragged, this would be “free money.” But alas, in reality the cash flow from those projects had to be used to pay the interest on those bonds, some of the touted the tax revenues had to be diverted into the pockets of bond holders as tax-free interest, or forgiven altogether as part of the deal that cities often made with the redevelopers. Unfortunately, the internet post cited above does not tell us how many of those failing malls were built with money raised through the sale of such municipal bonds, and whether,in spite of their failure, the cities that sponsored them and issued those bonds, remain on the hook for the outstanding balances. 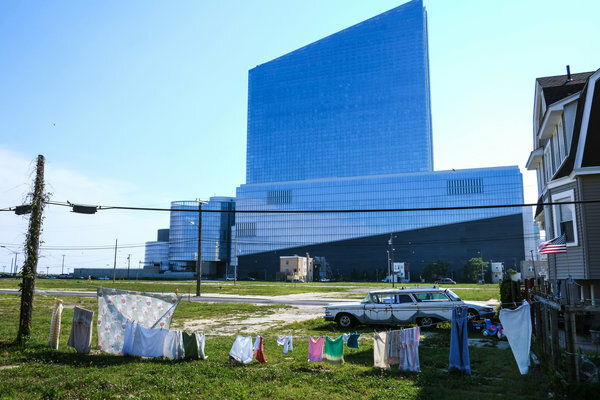 Remember how we were told by our betters that Atlantic City would be revived and rescued from its status as New Jersey’ slum-by-the-sea? How it would be done by establishing a bunch of casinos near the boardwalk and thus drawing a bunch of would-be high-flying gamblers who lacked the time or the funds, or both to travel to Las Vegas where the real legal action was. Which goes to show once again that redevelopment is development with the prefix “re” attached to it. Which is to say that it has its risks as well as its rewards. Sometimes it works and sometimes it doesn’t. If you still want to enjoy the thrill of gambling outside of Atlantic City, why not play some slots online? Casinor.com spilleautomater offers free spins at nye casinos like Betsson and Nordicbet. In the end, one picture is worth a thousand words. And here is such a picture brought to us by the NY Times. It’s the Same the Whole World Over, Including the U.K.
Now ain’t that a blinkin’ shame. So sang the British vaudeville performers over a hundred years ago, and we are getting a reminder of their wisdom in our field. We all know about the NIMBY phenomenon over here, but it is also alive and well over in the UK. It seems that over there, the same as over here, when you try to build sorely needed housing, you run into protests of NIMBY neighbors who try to keep the newcomers out. We learn this from the New York Times, Jenny Anderson, Britain Confronts Not-in-My-Backyard Attitudes, July 9, 2014, at p. B4. It goes pretty much the same way as over here. When a local developer proposed to build 34 homes, “30 miles southwest of London, it was doing just what Britain’s leaders were calling for; trying to alleviate a severe housing shortage that politicians consider a critical factor in the country’s soaring real estate costs.” That may sound good, but “[t]he local planning authority refused the initial 34-house proposal, raising a number of concerns — including calls for the installation of special external lighting to avoid disturbing the nocturnal activities of bats.” Bats’ “nocturnal activities”?! That’s what it says. So in the end — at least one hopes it’s the end — instead of those 34 new homes, the developer was permitted to build 14, four of which would be deemed “affordable.” And what about that chicken coop? Has it been saved? Sort of — it is being moved but ever so carefully, so that it is not damaged in the process. “Apparently it has sentimental value, ” said the site contractor charged with executing that delicate task. As of this writing, there was no word from the bats. As for the Britons who lack proper housing that they can afford, they’ll just have to lump it. As that vaudeville song tells us, they get, if not the blame, at least the burden of a housing shortage while the NIMBY gentry gets to enjoy their ambience and the lavish gains in home prices that do wonders for their home equities. Our thanks to our colleague and fellow blogger, Robert Thomas, for putting up a link to our most recent article on his blog www.inversecondemnation.com and for his kind words about our work in the most recent issue of the Michigan State Law Review. The article is Gideon Kanner, Detroit and the Decline of Urban America, 2013 Mich. St. L. Rev. 1547 (2014). Do read it. We promise you a good read in a non-lawyerly style, and an insight into the decline (and imminent fall) of older American cities. Its point of view takes cognizance of the effects of government policies that went into effect after World War II, which is to say the policies of encouragement and financial support of a massive city-to-suburbs population move. As urban populations said “bye-bye” to older cities, they left behind abandoned city neighborhoods and general urban devastation. Government-inspired and government-financed urban policies, such as urban redevelopment, and the construction of urban freeways, as well as the familiar litany of urban misgovernance and profligacy (e.g., bad, unsafe schools, generous but unfunded pensions, and rising crime, particularly in the 1970s) that are rarely considered in the conventional wisdom of “new urbanists” who, have executed an about-face (as compared with what they touted a half century ago), and who are now touting a yet-to-be-realized “return to the cities,” a phrase used to conjure up the unlikely vision of suburban populations abandoning their good life in the suburbs, and moving to more-or-less decrepit cities — a process that consists largely of a trickle of older boomer “empty nesters” who sold their pricy suburban homes for a bundle and are moving into “hip” city neighborhoods, and childless millenials. If you are skeptical of what we say here, and in our article, go to Google, type in “ruins of Detroit,” hit “enter,” and see what shows up on the screen. And remember, Detroit may present us with probably the worst-case scenario, but it is not unique, even if it is the leading American urban basket case. To get an idea (not ours, but the Establishment’s) of what the government promised, read the cover story of TIME magazine of November 6, 1964, THE CITY: Under the Knife, or All For Their Own Good, at p. 60. Then compare it with what it delivered. See what TIME had to say about that a half-century later. Daniel Okrent, Notown: Hubris, Racial Tension, Myopic Politicians and the Woeful Auto Industry Brought this Iconic American City to Its Knees, TIME, October 5, 2009, at p. 26, (cover story), and see the cover story of TIME of August 5, 2013, Is Your City Next? at p. 22, at 27, revisiting the Detroit calamity, and spotlighting Fresno, North Las Vegas, New Orleans, Philadelphia and Birmingham as the nation’s misgovernance “hot spots,” noting that there have been 36 municipal bankruptcy filings since 2010. Res ipsa loquitur. We can’t resist asking: So how is that “urban renewal” thing working out for those guys? Renewed any cities lately? Anyway, whether you agree or disagree with what we say in our article do read it with an open mind, and — who knows? — you may even agree with it. “While homeownership is down nationally since the housing market collapse, the drop among younger adults is particularly striking. Rates in the 25-to-34 age group dropped by nearly 8 percentage points from 2004 to 2013, according to a recent report from Harvard University’s Joint Center for Housing Studies. “Over the same period, student debt soared by more than 400 percent to top $1 trillion — a run-up that dwarfs the surge in mortgage debt during the housing bubble, said John Dyer, the lending practice lead for the Carlisle & Gallagher Consulting Group, which serves the financial services industry. He predicts the debt level will be a drag on home buying for years to come.” Emphasis added.